Summary: We will build on a study conducted during the summer of 2011 that utilized light sensitive cameras to document human/sea turtle interactions on the beaches at night within the Archie Carr National Wildlife Refuge. Though the data collected during 2011 is still being analyzed we plan on replicating the work conducted at the Barrier Island Center where guided sea turtle walks are conducted, but with a tighter collaboration between the guides to better quantify individuals on the beach that are not associated with the walks. Like in 2011, we will GPS all nest locations and coordinate this with the photographic data. This project also seeks to extend the range of our project to include a public beach access adjacent to one of the Refuge?s largest neighborhoods to quantify the numbers of individuals that are using the beach at night in an effort to assess the need for enforcement and education. An additional facet of this project is to further explore the use of manned telescopic cinematography to more clearly understand the types of human/sea turtle interactions as well as interesting turtle behaviors detected during the 2011 season. 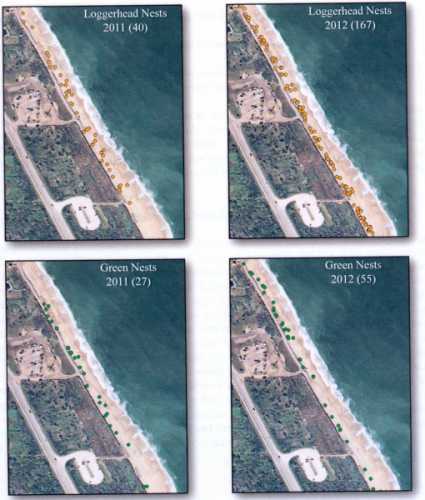 Results: GPS/GIS data collected in front of the Barrier Island Center as in 2011 revealed differences between the years. In 2011, on the 1,000 feet of beach directly in front of the Barrier Island Center, there were 40 Loggerhead nest and 94 false crawls (false crawls and body pits not resulting in a nest) for a nesting rate 29.9%. For greens in 2011 there were 27 nests and 67 false crawls for a nesting rate of 28.9%. There were numerous instances in both 2011 and 2012 where turtles did not emerge from the surf enough to leave a track on the beach and these are not represented in these numbers. In 2012, there were 167 loggerhead nests and 205 false crawls for a nesting rate of 45% while greens had 55 nests and 62 false crawls for a nesting rate of 47%. Watch video produced as part of this project, Archie Carr Refuge at Night.